For well over its 130-year existence, River Grove has been a place to call home, first by the Native American tribes, then by a few settlers—mostly of Germanic origin—to the melting pot it has become today. Through photographs, the reader will travel from the farmlands it once contained to a Polynesian paradise nestled near the banks of the Des Plaines River; a town where a thirsty whale could satisfy its appetite with legendary Vienna Red Hots, no ketchup, of course, and a mai tai. Considered a real-life "Mayberry" by longtime residents, it continues to have that small-town feel amid the hustle and bustle of a village bordering the metropolis that is Chicago. The oldest town in Leyden Township has literally weathered many storms—and floods—and as the townsfolk stood shoulder to shoulder filling sandbags, they realized that they indeed inhabit a "village of friendly neighbors." Local author and historian Kenneth J. 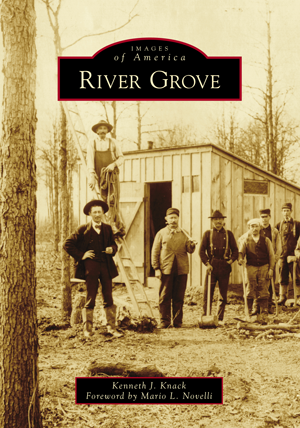 Knack, with the help of the River Grove Historical Commission and several other sources, has compiled images that tell the story of River Grove’s evolution. A portion of the royalties will be going to the historic commission to help preserve the history of River Grove.